In response to the great demand, the students presented again their project on Tuesday 27th of November in front of a selected audience at Campus Marburg. 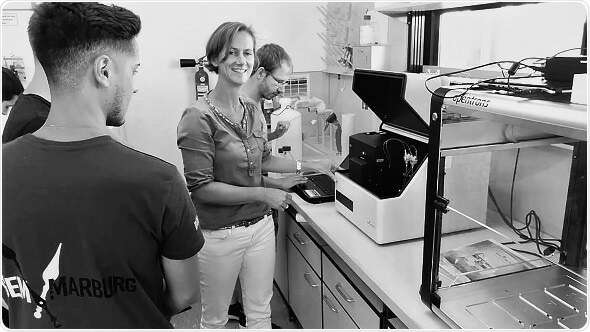 The company BMG LABTECH supported the team by providing a CLARIOstar® microplate reader. Over 200 interested participants attended the public lecture at the magnificent auditorium of the Philipps-University. Surrounded by ancient paintings and chandeliers, the team presented its award-winning work. Dr. Silke Angersbach, who acted as contact person from BMG LABTECH and introduced the device to the students, attended the talk as well. We are very pleased that we were able to support such a successful team. The students achieved fantastic results. Sincere congratulations." The young scientists focused on the bacteria Vibrio natriegens as an alternative to E. coli bacteria. In their project, the team developed three different cell lines: VibriClone, VibriExpress, and VibriInteract. The main advantage of these organisms is their rapid growth. Since Vibrio natriegens duplicate every seven minutes, experimental times can potentially be shortened, hence reducing lab costs. By awarding the team, the jury honours the project as forward-looking. The CLARIOstar was the key to the success of our project. We were able to generate foundational characterization data for genetic parts in V. natriegens, which is a crucial part for establishing V. natriegens as the next workhorse for synthetic biology. By characterizing all the different parts, we were able to win the special prize categorie "best part collection" and in the end the Grand Prize of the iGEM competition."